Tattoo trends come and go faster than you can say 'OUCH' but we reckon this one's got some staying power. Allow us to introduce you to glow in the dark or UV tattoos - they do exactly what they say on the tin, glow in the dark and only show up under UV light so they're 100% suitable for work. 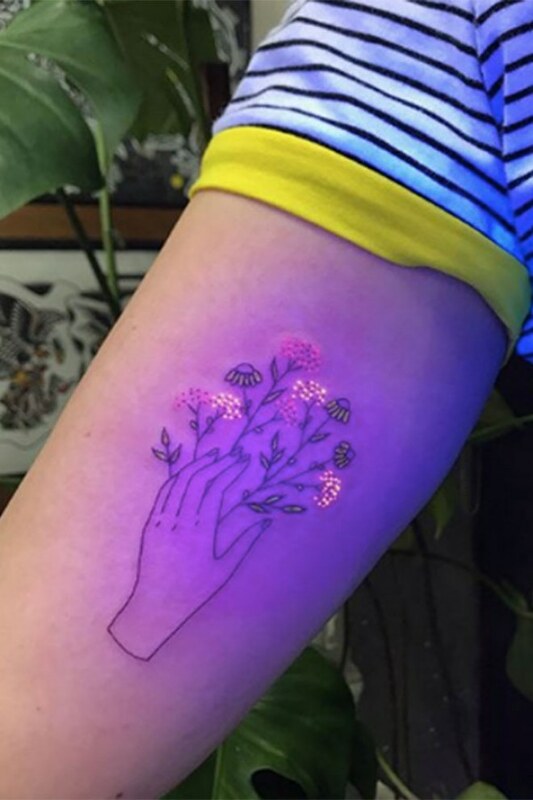 It's not clear who's the OG creator of this latest inking craze drawing circles around the tatt fan girls and boys of Instagram but artist and tattooist Kayla Newell is one of the main people championing it, sharing her finished intricate, light-up designs on the platform. UV tatts are achieved using a solution containing phosphorus ink as opposed to standard tattoo ink which is a metal, vegetable or plastic-based pigment suspended in a hypoallergenic carrier solution. But some tattooists don't agree with this as phosphorus is toxic in some forms. We recommend thoroughly researching and seeking professional advice before going ahead with a UV tatt. In the mean time, here's 30 of Instagram's most intricate designs to get the creative juices flowing.